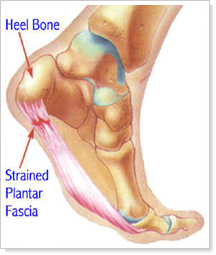 Because Plantar Fasciitis is aggravated by standing and walking, it can often affect people for 3 to 9 months. Many jobs require hours of standing, and anyone who is relatively active can experience a slow recovery because of everyday walking and standing. Those in professions that require continuous standing can have a tendency toward long-term problems. People who spend significant time on their feet are prone to Plantar Fasciitis. It's common in those whose jobs require long hours on hard floors, such as nurses or salespeople. Those who are physically active, especially runner and joggers who have recently increased their mileage or intensity also often experience Plantar Fasciitis. As we age and carry a few extra pounds, we can be more prone to Plantar Fasciitis due to wear and tear on the body and increased stress on the fascia. Poor quality footwear can result in increased stress on the plantar fascia, due to the fact that they do not absorb the shock the way new or high quality shoes do. In Arizona, those who wear sandals and flip flops frequently can aggravate the plantar fascia. Other conditions such as over-pronation, flat feet, improper foot mechanics or poor walking mechanics can also lead to damage of the plantar fascia and continued aggravation. Rest and ice are key parts of home treatment for Plantar Fasciitis, which is directed at stretching tight muscles, decreasing chronic inflammation and encouraging proper healing of the fascia. Additionally, orthotics and night splints can be used to decrease stress and support the arch and fascia. Electrical stimulation and ultrasound are effective physiotherapy treatments which decrease inflammation of the plantar fascia, while stretching of the calves and hamstrings is another key component of therapy. This reduces stress and improves walking mechanics. Your healthcare provider may also prescribe proprioceptive and foot strengthening exercises, which will further strengthen the foot and decrease stress on the plantar fascia. Because plantar fasciitis often involves cycles of inflammation and healing, it can be hard to treat. Scar tissue formation on the fascia can result from these repeated cycles of rest and stress. Although the scar tissue develops as a temporary patch while the area is healing, these patches can become injured daily just by standing. This results in an injury that does not heal correctly and condition that can last months or even years. Alpha Chiropractic has found the Graston Technique to be a very effective treatment in breaking up the scar tissue, allowing the plantar fasciitis to heal correctly. Soft tissue fibrosis and chronic inflammation are treated with the Graston Technique's instrument-assisted soft tissue mobilization. Once the patches of scar tissue are broken up, proper healing and a reduction in pain usually result. 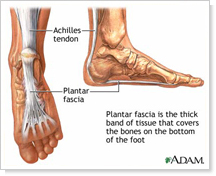 As with most injuries, plantar fasciitis is best treated early. The longer the injury goes untreated and the more severe it becomes, treatment will become more involved. If you are experiencing symptoms of plantar fasciitis, seek help from an experienced provider as soon as possible. Call Alpha Chiropractic today to resolve your plantar fasciitis at (480) 812-1800.